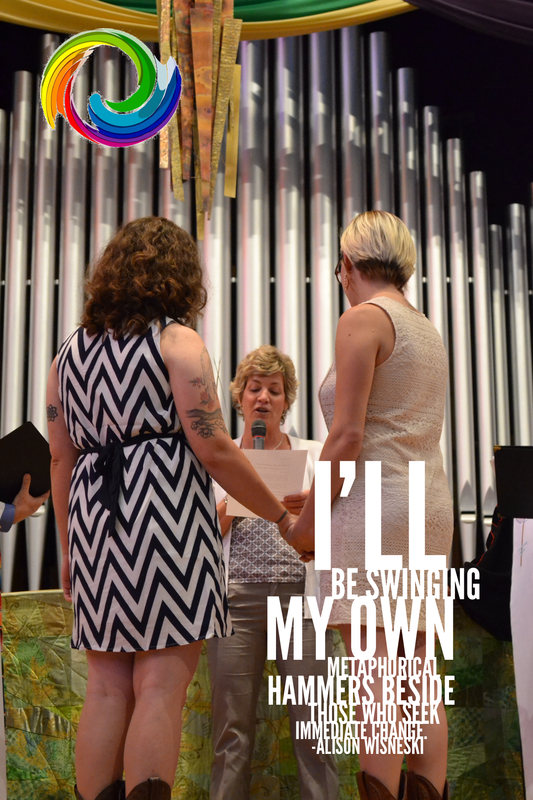 As the discussions in Portland ebbed and flowed around the conflict within the UMC – a conflict that is abusive to LGBT people, sometimes it was deemed “uncomfortable.” For me it was far worse than “uncomfortable” to withstand another public beat-down. And please understand, it is not just the ones argue with us, we are also beaten down by all those who avoid real conversations and wish to look away. One metaphor from the stage was that “both sides come to GC with swords drawn” and the audience tacitly agreed. I caught that guy later and said his image was not true. We do not carry swords – we do not ask for the annihilation of straight pastors and their families – calling for trials against pastors and marriages. While we have felt the harm of those swords of words and trials, my people come with band-aids, song and rainbow promises of a God who will not abandon us. Yet at that big UM meeting in Portland this week, a small, faithful cloud of witnesses gave body and voice, finances and passion to the cause of inclusion. We believe it is the gospel of Jesus Christ. I was grateful on the first morning that Rev. Steve Lewis and Rev. Fred Day of the Archives and History, both did break the silence and name gay and lesbian inclusiveness as part of their witness. Very helpful, but then they were the only ones. 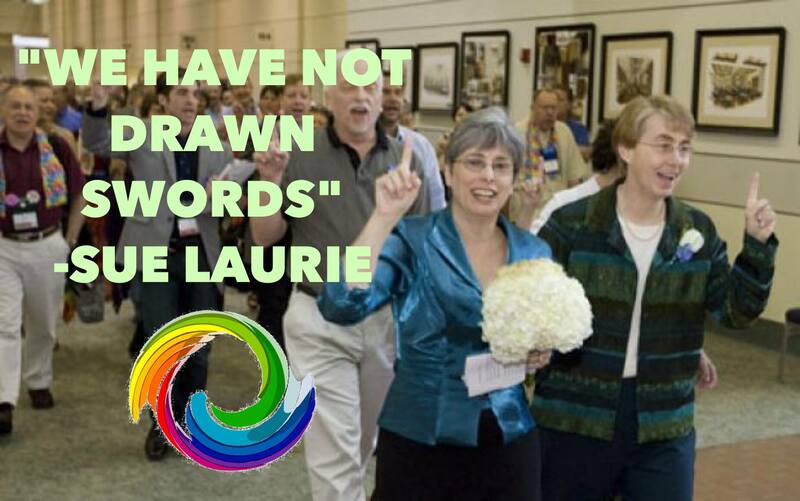 Listen to me, these people, these gathered Methodist delegates and agency people, they know that homosexuality is not a sin, yet they avoid us and are “tired of talking about it.” Well I am tired too. And I am so thankful for every moment that Love Prevails strove to offer light and grace. We fought the good fight, we tried. Please pray that I do not become complicit with the institutions of Methodists that are doing harm! Just because I’m tired and I don’t enjoy fighting, please pray that I will not sink into my comfortable privilege and say, “I don’t need this.” Pray that I will stay in solidarity with those still being harmed by United Methodists. Pray that I will lean forward into General Conference and be spiritually fit – able to speak, apply band-aids and trust the rainbow of God’s promise for the full two weeks, with style and grace… even as we differ from others. Lastly, thank you Love Prevails for stirring this pot for the whole quadrennium… by disrupting the usual dormant period, I can feel hope for integrity.